Active lifestyles place unique demands on our eyewear, and the perfect frames for a day in the office might not be suitable for mountain biking, hiking, golf or five-a-side football. If your weekends involve personal bests rather than box sets, dedicated sports eyewear could be as important as supportive trainers or a workout playlist. Contact lenses are ideally suited to physical or outdoor activities and today’s lenses are more comfortable than ever. Prescription goggles are ideal for swimming, providing clear vision and protecting the eyes from waterborne contaminants and bacteria. Sports frames can be adjusted in our practice to ensure a perfect fit – they should ideally wrap around your face, to provide a wide field of vision without any awkward blind spots. (Full-face frames will also block out dust and rain). 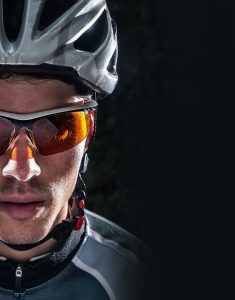 Look at the eyewear worn by top athletes for inspiration, and ask our advice about optimal choices for your sporting or lifestyle preferences. Despite being made out of lightweight materials, polycarbonate lenses shrug off impacts from flying objects. Polarized lenses reduce glare from lights or reflections, while photochromic lenses automatically darken in bright conditions and give 100 per cent UV protection for outdoor use. Finally, scratch-resistant coatings are great for sports where you might be in direct contact with the elements.